If you have a dog, then you know what I’m talking about when I refer to that oh so dreaded dog pee! It can ruin your flooring in no time — including carpet, linoleum, and wood floors. Especially if it’s not cleaned up the right way. Plus, it stinks! Fortunately, it is possible to remove dog urine from the surfaces inside your home. You just need to do it the right way in order to preserve your floors. There are lots of different ways to remove wet urine stains from flooring, and even more ways to remove set-in dog urine stains. Choose the one you like best, based on what you already have on hand in your home. First, absorb as much of the urine as you can using paper towels or super-absorbent microfiber cloths right away. The quicker it’s removed, there’s less of a chance that the urine will ruin your carpet or settle into the padding or sub-flooring underneath the carpet. The Last Step: Neutralize The Odor! No matter which of the above methods you use to remove dog urine stains, you should always follow-up with an odor neutralizer once you’re done cleaning the spot. 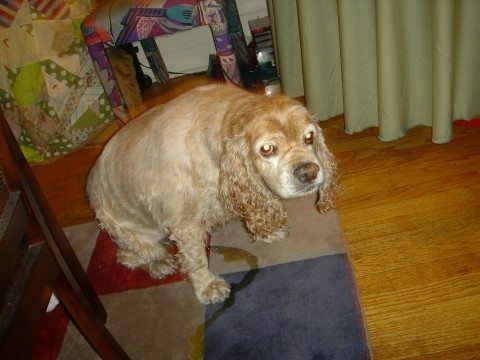 Products like Zero Odor (which bonds with odor molecules changing them into non-smelling molecules), Simple Solution Extreme (a pro-bacteria and enzyme formula), and XO Odor Neutralizer (which binds to odor molecules and neutralizes them naturally) permanently neutralize the odor — so your dog won’t be as likely to return to the same spot to urinate again. Not sure exactly where the pet stains are on the floor? 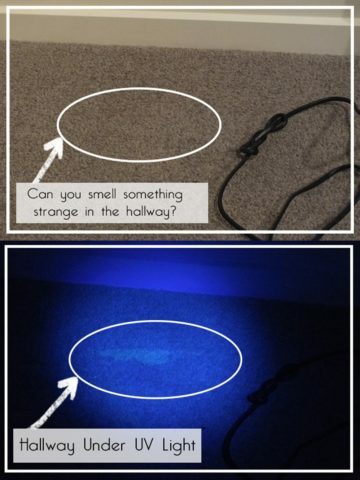 Sometimes — especially with carpeting — it’s hard to see where the urine stains are. 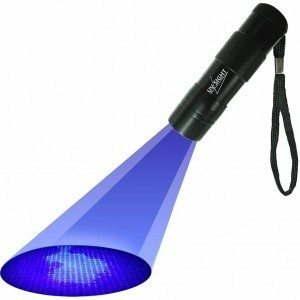 Many pet owners use an LED UV black light flashlight to locate fresh stains, as well as set-in stains. It works equally well on both.